Here's a yummy St Patrick's desert! 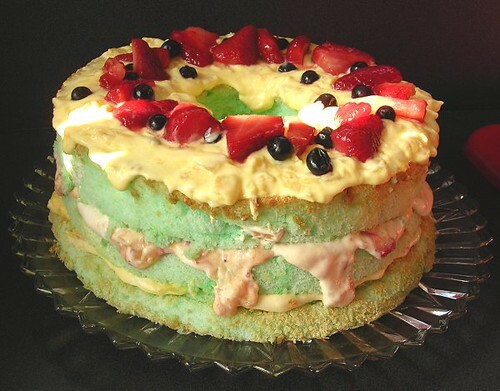 I started with a boxed angel food cake and cooked it according to the box directions while adding a splash of vanilla and almond extract to the batter and some green food coloring for this St Patty's day desert. The topping is basically whipped cream, crushed pineapple and vanilla instant pudding then I added some strawberries to one layer and blueberries to another. Top it with strawberry slices and blueberries. This was a big hit when I made it before!